The Politically Incorrect Guide to American History by Thomas E. Woods Jr. This Much Is True: You Have Been Lied To. The government is expanding. Taxes are increasing. More senseless wars are being planned. Inflation is ballooning. Our basic freedoms are disappearing. The Founding Fathers didn't want any of this. In fact, they said so quite clearly in the Constitution of theUnited States of America. Unfortunately, that beautiful, ingenious, and revolutionary document is being ignored more and more inWashington. If we are to enjoy peace, freedom, and prosperity once again, we absolutely must return to the principles upon whichAmericawas founded. But finally, there is hope . . . In THE REVOLUTION,Texascongressman and presidential candidate Ron Paul has exposed the core truths behind everything threateningAmerica, from the realreasons behind the collapse of the dollar and the looming financial crisis, to terrorism and the loss of our precious civil liberties. In this book, Ron Paul provides answers to questions that few even dare to ask. Despite a media blackout, this septuagenarian physician-turned-congressman sparked a movement that has attracted a legion of young, dedicated, enthusiastic supporters . . . a phenomenon that has amazed veteran political observers and made more than one political rival envious. Candidates acrossAmericaare already running as "Ron Paul Republicans." "Dr. Paul cured my apathy," says a popular campaign sign. THE REVOLUTION may cure yours as well. This much is true: you have been lied to, robbed and used by your own government-the people you elected into office and the people you should be able to trust...In a nation thirsty for change, THE REVOLUTION is Ron Paul's call to arms. Moving from topic to topic at a quick pace, whittling everything down to its bare essentials, Paul tackles everything facing us today: the false choices in American politics, foreign policy as it was laid out by the founding fathers, how we can achieve economic freedom, how we should view abortion, civil liberties and personal responsibility, and what role the government is supposed to play in our lives. As Barry Goldwater defined conservatism in the 60s, Ron Paul redefines it for the 21st century with THE REVOLUTION. "The real truth about Liberty. This book takes a wrecking ball to the political establishment. Senator Goldwater would have loved it -- it's The Conscience of a Conservative for the 21stcentury." The Revolution : A Manifesto. 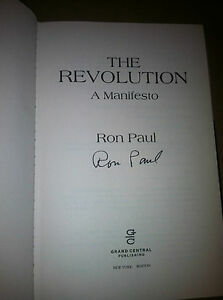 AUTOGRAPHED BY RON PAUL! BY RON PAUL. LIKE NEW & SIGNED. If you want to wake somebody up, give them this book. I just wish it went into more detail on his foreign policy. He gives a good baseline of foreign policy and great understanding of everything else. I thought he was too much of a pacifist after I read this book. I've heard him reiterate on some other shows and now I understand that he is only a pacifist when it comes to aggression, which makes a lot of sense. I heard him say they should never go to war unless they are attacked, and if the U.S. is attacked, they must destroy the enemy fast and thoroughly so that the troops can get back home and no one will ever want to mess with the U.S. again. He doesn't want wars costing America respect, or future generations trillions and trillions of dollars. This is really a great book. I would recommend it to anyone and everyone. Ron Paul's Revolution "A Manifesto"
Freedom, Liberty, Limiting Government's Influence over your day to day life, Economy....... If any of these topics peaks your interest, and as an American Citizen I sure hope they do, then this book is a must! Many political books are so bogged down in language that is, in my opinion purposely vague and technical, Dr Paul writes with humor and urgency that is evident in every page. And he asks the questions that others don't have the guts to ask. For example, why are we spending trillions of dollars every year to keep military bases in countries that to not need or want our presence? Why do we push our Democratic ideology on other governments, yet oppose when the people choose a leader that has views that go against America? Why can the government not see that without the gold standard our money is quickly becoming valueless? He not only asks the questions, he give plenty of resources for the reader to see for themselves where his information comes from. In short, if you believe that our Constitution is to be upheld as written, and not to be bent to the convenience of what government wants to accomplish at any given time, if you want to learn more about where your tax dollars are going, if you believe that each person is entitled to freedom and liberty, I urge you to buy, beg, or borrow a copy of this book! Everyone could benefit from questioning the authority. It's what our forefathers counted on when drafting the Constitution! So, no matter who you are supporting this November, give this book a go. By far the most comprehensive overview on the philosophy behind the freedom movement ever written. Not only does Dr. Paul cover a ton of important topics but he writes in a way that makes usually hard subjects like the economy and foreign policy easy for the average person to understand. If you have been looking at America and trying to figure out what went wrong, you need to read this book. If you value freedom and liberty and the American dream you should not only read this book but tell your family and friends about it. Seriously, it is hands down the best book I have ever read. 5 HUGE Stars. After reading this book, It opened my eyes to alot of things that not too many people talk about anymore, such as personal freedoms. Its amazing how much Government can change when a generation turns its back and stops paying attention to what those whom we put in power do with it. I encourage anyone who hasnt heard about Ron Paul, have head about him, and even those who dont support him to give the book a read. It would be in everyone's best interest to have this knowledge. Excellent manifesto on the true nature of the American government. Congressman Paul reconfirms what most Americans already suspect that politicians in Washington are servants to the highest bidder and not the American people. Straight forward and easy to read expose of the real issues politicians do not want to discuss. A must read for every freedom loving American. Congrats to Congressman Paul for his honesty, integrity, and genuine concern for the people of the United States.